Last week I was in the Chattahoochee National Forest connecting with my middle son and enjoying the beauty of the Appalachian foothills. 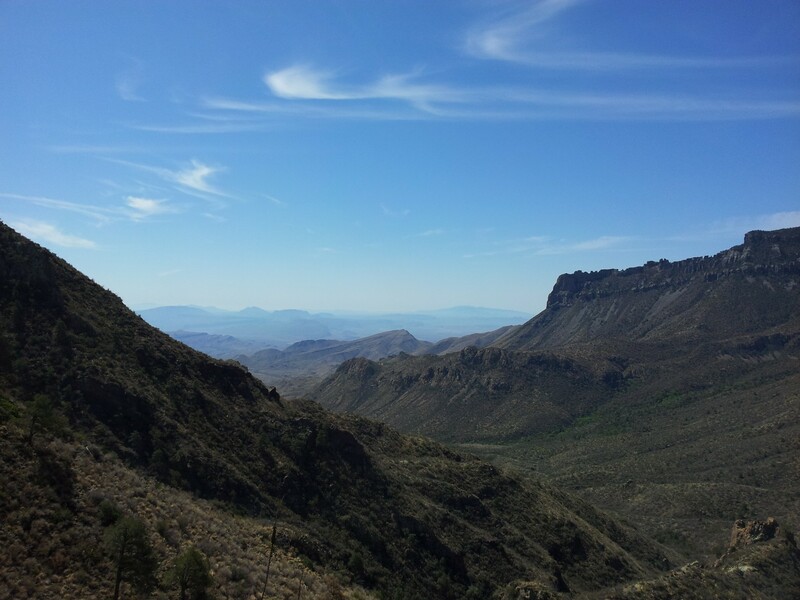 One of the many vistas from the Lost Mine Trail in Big Bend National Park. While the natural beauty of both locales was undeniable, this week’s destination refreshed me in unexpected ways. Mountainous desert with an assortment of scrub trees, cacti and clumps of yellow grass isn’t my first thought of a beautiful terrain. But the stark landscape combined with the thought-provoking presentations by retreat leader Belden Lane prompted me to contemplate all of the physical and metaphorical wildernesses I’ve experienced in my life. Physically, the visual beauty of the mountains and desert of Big Bend reminded me of a 1994 trip to New Mexico, Arizona and Utah. Metaphorically, the stark barrenness felt similar to a period of isolation and loneliness I experienced in the mid-1990s. I didn’t get home until late last night, so I am still processing the week and what it means. This post is part of my attempt to extract meaning from the experience. 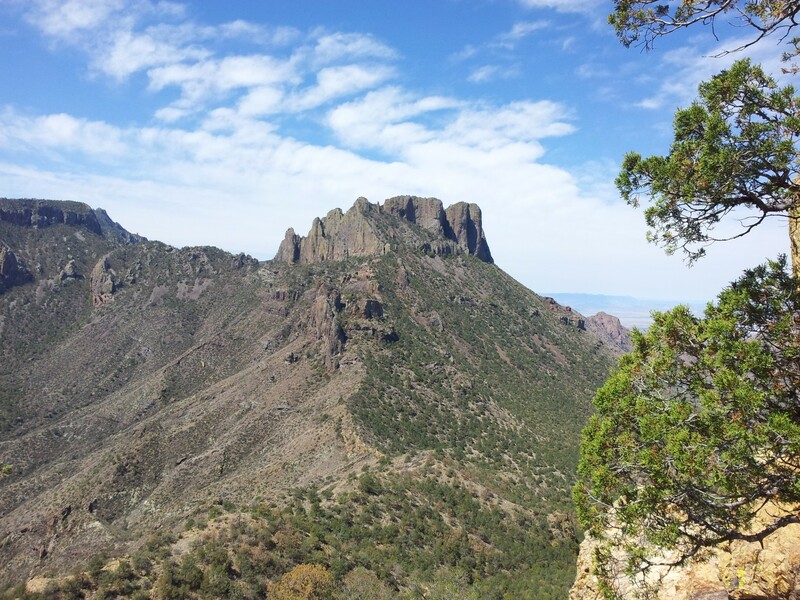 A nearby peak, shot from the top of the Lost Mine Trail in the Chisos basin. On Tuesday I hiked the Lost Mine Trail in the Chisos Basin, climbing about 1,100 feet in elevation over two-and-a-half miles up the mountain. It wasn’t a difficult climb. We kept a leisurely pace, stopping frequently to catch our breath, snap photos and sip from our water bottles. As the sun warmed us, the breeze cooled us. During the lapses in our conversation, I was able to notice lizards, buzzards and a colorful scrub jay. I’m not an overly mystical person, but I kept hoping throughout the hike to hear a word from God. I was seeking answers to life’s big questions that occupied my mind. The only consistent voice was that of the crunch of the stones underfoot. I guess the rocks can really cry out their praise to their creator. The Rio Grande River flows into Boquillas Canyon at the Mexican border. 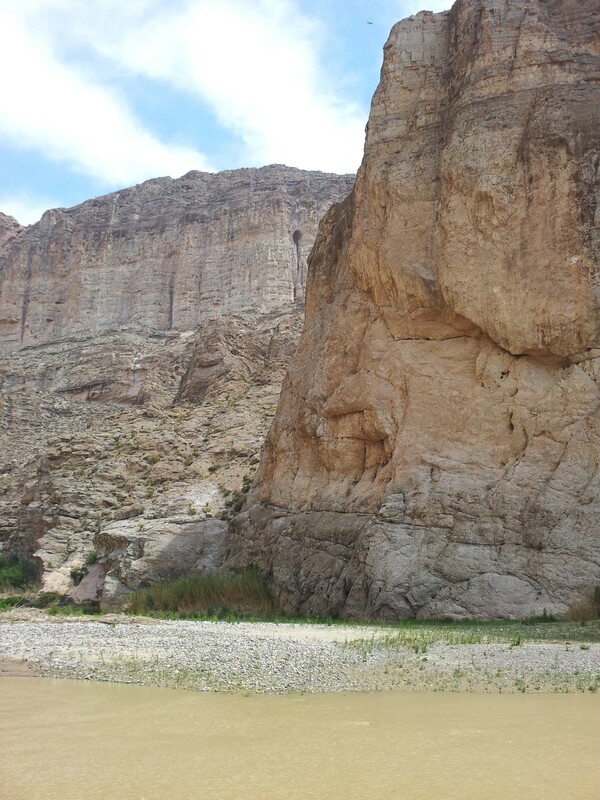 On Wednesday, I made my way down to Boquillas Canyon on the Mexican border. The cave-pocked cliffs pierced by the gently flowing Rio Grande River presented an altogether different beauty than the Chisos Mountains. Temperatures were warmer. Breezes were rarer. I stood on a large, beige rock overlooking the Rio Grande and caught sight of a couple of vaqueros on the other side in the shade, their horses drinking from the gray water. The small village of Boquillas, Mexico, was off to their right, a couple of dozen houses filling the gaps between the trees in the green valley. At my feet were an array of hand-made trinkets and hand-painted crafts with an ink-on-cardboard sign indicating the prices tucked under a plastic jug. A few feet beyond this low-rent retail space was a sign in official U.S. brown stating that purchases from Mexican nationals was a crime. As I scrambled down the rock and toward the river, I could hear the familiar strains of the chorus “Aye, aye, aye-aye.” Another jug with a handwritten sign was nearby. Victor, the Mexican crooner, made his living taking requests a few feet onto U.S. soil, a short swim/wade from his homeland. From there we progressed to the hot springs and the ruins of an old resort. Bubbling from the corner of a cement tank just a few feet from the Rio Grande, the spring was more warm than hot. The algae floating on the surface made me question its restorative powers. A couple of tourists soaked their feet, and I repressed a shiver at the thought of taking a sip. Still, I heard no voice, discerned no wisdom. The desert was indifferent to my presence and made no attempt to reveal any secrets. I was not tempted by Satan or fed by ravens, though Biblical analogies came to mind quickly. I conjured no visions, received no epiphanies. Maybe the time in this fierce landscape wasn’t about answers. Maybe it was just about seeking and listening. After back-to-back weeks of silence, night skies filled with stars and breathable air, I am reticent to return to the normal. Another trip into the wilderness is already being planned. Maybe I’ll get a little bit closer to the answers next time. Does the wilderness inspire you? Where do you like to go in nature when you are in need of answers? Leave a comment below and share your experiences. This entry was posted in Uncategorized and tagged Belden Lane, Big Bend, Big Bend National Park, Boquillas Canyon, Chattahoochee National Forest, Chisos Basin, contemporary South, desert, hike, hiking, Lance Elliott Wallace, Lance Wallace, Lost Mine Trail, Mexico, mountain, New South, New South Essays, NewSouth, Rio Grande River, Solace of Fierce Landscapes, South, Southern, Southern Culture, Southern Living, Southerners, spirituality, Texas, the South, travel. Bookmark the permalink. Thank you for sharing your retreat experience, Lance. I left Texas a long time ago, but it has never left me. Your photos were wonderful! I’m glad you had an enjoyable “desert experience.” Living in the driest desert on earth has really made a difference in how I read scripture passages that deal with the desert. I can better visualize dry, barren earth that goes on for miles because I need only drive to the outskirts of town to get there. I’m blessed in that I only need to drive a few miles in the other direction to see a small stream that has brought an entire valley to life.